What are the best Pillows for Pregnant Women? Although pregnancy is one of the most wonderful moments a mother can experience, it can also be the most uncomfortable, especially when sleeping and the once baby bump has grown into a full sized round belly. You want to keep your belly in the most comfortable position so that there will be no pressure put onto the baby growing inside it. Remember, what separates the baby from the outside world is just your skin and a few layers composed of fat, etc. It’s easy to harm the baby inside by pressure and strong forces coming from the outside, especially when you are asleep and unconscious of the world around you. This may not be a problem if you are a sleeper whose movements are restricted, but if you are the type who travels around the bed, it can be a problem. Therefore, what you need is a maternity pillow that doesn’t only ease your sleeping position but also protects your belly. The most important aspect of using a maternity pillow is more for comfort as the instances for harm on your belly is very rare. What are the factors to consider when looking for the best pillow for pregnant women? Maternity pillows come in varying shapes and sizes but they all have one thing in common: they’re soft and structured and they are the mother’s best friends during sleepless nights when finding the best comfortable positions to sleep can be considered very trivial yet difficult. There are different kinds of fill for your pillow. You can choose from natural fills that are from the feather and down of geese or ducks or synthetic fill made from polyester. There’s also the so-called memory foam, which is great because it molds into the natural figure of your body, while still being very firm. Depending on your choice of firmness, the best for support is a memory foam or polyester. But if you’re looking for great comfort and you want one that is soft as clouds, go for natural fills. There are different designs and shapes catered for pregnant women. Depending on your choice, you can get as little pillow as possible, or as tall as you. See below for the different designs or shapes you can get. These pillows are also called total body pillow as it encloses the entire body around a very bulky pillow. Usually, it’s U-shaped and gives full support for the belly, back, knees, and ankles. The mother can wrap it around herself and can serve not only as a full body support but also for barrier. The only downside for this type of pillow is that it’s too big and can be very difficult to wash and clean. It also barricades the wife to the husband, so there is very limited cuddling, which matters. No repositioning pillows during the night, simply turn from side to side. This is great for pregnant woman who move around in their sleep. The pillow is capable of supporting both side and back sleepers. This pillow has polyester filling. This pillow can be used not only to support the back but also the belly. It can be slide underneath the belly while the pregnant woman is lying on her side. The primary purpose of the wedge pillow is to provide support for the belly as it may drag down the entire weight of the mother down. When the mother tries not to put much weight onto the belly (so that it doesn’t pull her down when she’s lying sideways), it may take a toll on her back for constant resistance. Therefore, a wedge pillow levels the belly so that the back retains its straight posture. These pillows are not recommended nor nursing but they’re good as a sleep aid. It’s also very portable because of its small size, unlike full-length pillows. 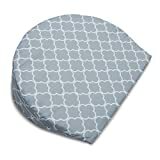 This wedge pillow is made of 50% cotton and 50% polyutherane foam making it soft and firm at the same time. 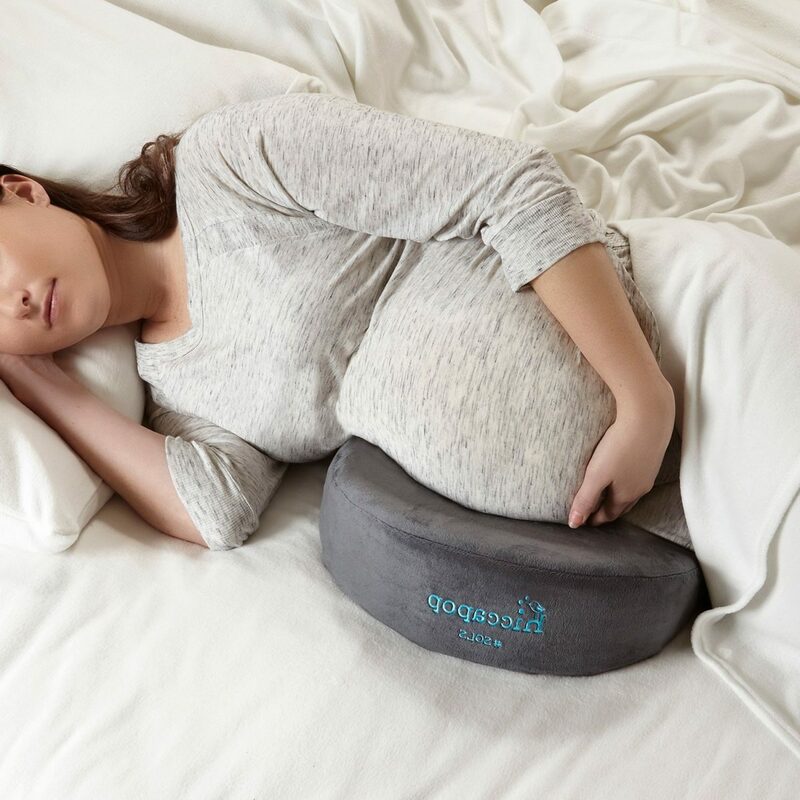 This wedge pillow can effectively support the belly of pregnant women who sleep on their sides. It has a durable quilted vinyl cover that resists moisture. This type of pillow is very similar to the wedge pillow in terms of belly support, the only difference is the shape and the added function of the bean pillow that can also double as a wedge for the hips and legs. To give you an idea of how to use a bean pillow, the thicker upper part of the pillow is used to support the belly while the bended narrow part is used for support in between the pregnant woman’s legs. Medium-sized pregnancy pillow provides just the right support for hips, legs and bump. 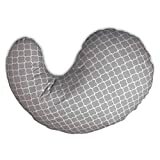 This bean pillow is great if you want support not only on your belly but also on your waist and legs.It essentially has all the points to support the important body parts of a pregnant woman, much like a full-length pillow, without being too bulky. Key Takeaway: The most important thing for choosing the best pillows for pregnant woman is comfort and support. You want to be able to look for the perfect pillow that alleviates all the pressure and heaviness you feel. When you sleep, you should be able to relax fully despite how big and rounded the belly is. The parts of the body that need the most support are the belly, waist, and back. The best pillows for pregnant women are those that are able to support their belly, waist, and legs. Maternity pillows are a great help for pregnant women who find it a struggle to sleep every night because of the lack of support on the aforementioned pressure points. These pillows are very essential if the pregnant woman wants to get a relaxing sleep without tossing and turning in bed for hours.